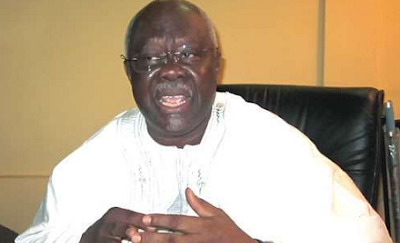 A PDP national chairmanship aspirant, Bode George, has challenged other contestants to an open debate on their vision and agenda for the party. This was contained in a statement issued by his political adviser and media aide, Uthman Fadipe, on Sunday. According to the statement, Mr. George gave the challenge during his visit to party delegates in Sokoto on Saturday as part of his campaign tour of the country. The former PDP vice chairman told the delegates that he was a committed party man who would deliver the best if elected. He also said that the micro-zoning of the national chairmanship to the South-west would be in the best interest of the party. Mr. George said this was in line with the resolve of the founding fathers to promote equity and balance in the distribution of party offices. He praised the Sultan of Sokoto, Sa’ad Abubakar, for his patriotism and embracing of all Nigerians irrespective of their faith or tribe. The News Agency of Nigeria reports that the party has fixed December 9 for its elective convention.